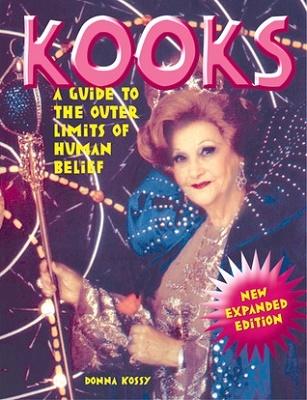 As part of American Odd, my new themed essay series over at the Chicago Center for Literature and Photography, I wrote an essay on the cult classic book Kooks: A Guide to the Outer Limits of Human Belief, by Donna Kossy. In this interview, Donna Kossy and I discuss Kooks, kooks, and the educational importance of strange belief systems. What inspired you to write Kooks? It started as just a few pages in my zine False Positive (the Kooks Pages) when I was living in San Francisco. It was a way to share all the kook flyers that were handed to me on the street. They were one of the most intriguing aspects of living in that city. Each one was a mystery and a research project in and of itself. After I became known as someone who collected those flyers people began sending me not just flyers but pamphlets, books, anything kook-related, and my kook files exploded in volume. This became the most interesting development related to my publication of zines, so I decided to concentrate on kooks exclusively and Kooks Magazine was born (by then I was living in Boston). That’s when I began to dig deeper into the ideas presented in the material. I researched the history of the ideas and sometimes the biographies of the authors, and wrote full-blown articles for the Kooks zine. In the back of my head I thought some day I might write a book, but didn’t think I was ready for that. But then I moved to Portland, OR, met Adam Parfrey who offered me a book deal for a Kooks book and of course I said yes. All this time there were a few people covering similar areas, but mostly, I was revealing obscure and previously unknown ideas and characters to my audience that nobody else was, so I felt I was providing a service. Why is it important to record and understand the varieties of “kookdom”? I don’t know that it is “important” to everyone. But in my case, it was probably pure curiosity. I like to find out where ideas come from and the stories behind people who are not like me, how they came to believe that the earth is controlled by lizard people or that we’re living on the inside of the earth. Digging into those questions often leads to a better understanding of how certain ideas became accepted or mainstream, while the others were left in the realm of pseudoscience, cult beliefs or kookdom, and so a better understanding of history and where we are today. But it’s also important because many kook ideas are emotionally powerful and they never go away for that reason, becoming popular at various historical periods. A good example is antisemitism (the conspiracy variety) which was mostly dormant after WWII but starting gaining in popularity starting in the 1990s. The less familiar you are with the history of these ideas, the more easily you can become ensnared by them. What most fascinated you when when working on Kooks? It’s hard to pick just one thing, but I’ll just say the endless stream of kook and kook ideas in the world. Whenever I think I’ve “seen it all” another person or website or book that is bizarre in a previously unheard of way comes to my attention. On the other hand, there is the endless repetition of the same kook ideas over and over and over again, by newcomers. So I’ll say the combination of the endless variety and the endless repetition. Kooks came out before the Internet became a dominant media source, although the Digital Divide still exists. Are you still receiving contributions to your “Kooks File”? Beyond the Internet, are kooks still thriving in print media? I do receive some contributions, but very little by now, partly because of the Internet, but also I’ve mostly retired from kook research. But yes, there are still books and flyers coming out. But I’d say most kooks have gone digital by now. In Kooks, you have intellectual differences with Martin Gardner, the popular science and mathematics writer. Can you explain these differences in more detail? When I wrote Kooks, I think my problem was his attitude towards the people and ideas he was writing about, which, if I remember correctly, came off as sneering and disdainful. I preferred a more kindly and open attitude. I didn’t want to seem as if I was making fun of people (though in some cases this was hard to avoid). I wanted to give them their due, or rather, give them their day in the court of ideas. And for the most part this worked, as many people didn’t seem to mind being featured in Kooks Magazine or Kooks the book to the point where they were seeking me out, rather than the other way around. One misconception about kooks is that the ideas are obscure and discredited. How do concepts like plate tectonics and phrenology illustrate the fluid nature of kookery and mainstream scientific thought? What can the study of kooks tell us about our society? Can this serve a greater educational purpose? Well, it can probably tell us something, but what that is is probably very open to interpretation. For example, some kook materials can be seen as clear reactions to changes in society, or as reactions to who’s in the White House. During the 1990s Clinton years there was a huge fear among hard right conservatives that the federal government was going to take away their freedom. So the militia groups, survivalists and right-wing conspiracy theorists gained in popularity. On the other hand, I expected that there would be a huge increase in the most extreme kook white supremacy groups starting in 2008 with Obama in the White House. But instead, the more mainstream Republicans and then Tea Partiers became more racist. At the same time lefty conspiracy theorists have gained in numbers I believe since 9/11 (the 9/11 truthers, etc.) But many of these trends are a result of greater exposure via Internet, as well as to various events. It’s hard to come to any conclusions about society in general. In 2001 my second book Strange Creations (about weird theories of human origins) came out. From 1996 to 2003 or so I did a zine called Book Happy, which had some similarities as Kooks magazine, but was focused on collecting and review weird and obscure books of all kinds. These days I still collect weird books, but I mostly sell them as an online book dealer. I’ve also returned to art. I had begun my career in the the alternative press as a collage artist. A few years ago I took up collage art again, this time digital collage using Photoshop. I’ve written a few articles here and there, but nothing in the past few years.